NEW up to 12 Ghz RF WiFi Bluetooth GSM DECT Anti Spy Wireless Signal Frequency Bug Detector TSCM KJB DD1206. 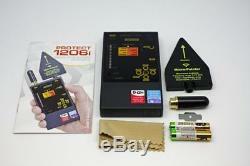 The Protect 1206i is a new class of counter surveillance device. Unlike all typical searching devices it can detect modern'hidden' bugs which use such protocols as Bluetooth and Wi-Fi at a long distance. Such bugs, especially Bluetooth types, are practically undetectable by common RF detectors due to their very low transmitted power and special type of modulation. The i Protect DD1206 uses a separate channel with a high, (2.4/5 Gz) frequency pre-selector to detect and locate Bluetooth and Wi-Fi with a much higher sensitivity. The unit also then processes the demodulated signal in order to identify which protocol has been detected. In addition the unit can detect all'classical' bugs and inspect them for the presence of correlation by sending sound impulses as well as other digital transmissions at a standard distance GSM, 3G, DECT, etc. The DD1206 is a sophisticated handheld radio frequency detection device that incorporates the ability to detect nearly any type of wireless protocol including digital frequencies such as Wi-Fi and analog frequencies reaching up to 12Ghz in range. Making this detection device extremely successful at finding unwanted surveillance threats are the two different antennas users can deploy and the demodulation feature which enables the users to hear the sound signature of the frequency. Main antenna 50MHz 12GHz Wider coverage , particularly at lower frequencies, has made it possible to increase the detection distance of a conventional VHF/UHF bug by 2-3 times, while saving perfect sensitivity at the higher bands GSM, Wi-Fi, Bluetooth, etc. Anntena 2 1.4-2.48 GHz and 4.9-5.875 GHz This is the first time when an affordable RF detector gets the microwave log-periodic directed antenna supplied in the standard set. 2-4 times longer distance to all sources above 2GHz Wi-Fi 2.4GHz, Wi-Fi 5GHz, Bluetooth, Wi-Max, LTE High, etc. The directionality provides easy pinpointing of a wireless source. 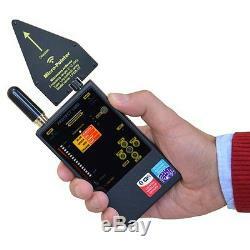 Now you not only know that there is a Wi-Fi source, but can quickly pinpoint it. Increased sensitivity to Bluetooth/Wi-Fi signals allows the operator to detect wireless sources at distance of 50 cm- 2 m.
Detects GSM, LTE, Wi-Max Bluetooth, Wi-Fi 2.4GHz an Wi-Fi 5GHz and RF and wireless video cameras. 16-segment bar graph indicator providing a wide dynamic range. 3 modes: sound, vibration and mixed. 2 levels of sensitivity (attenuator). Also, when the unit detects other transmission different sounds will come from the unit depending the type of transmission it detects. How to Use DD1206 Detector - YouTube. Video will open in a new window. 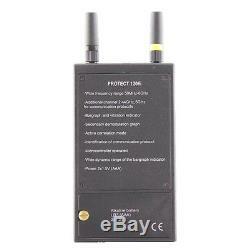 Detects Bluetooth, Wi-Fi, DECT, GSM, and RF. Unit Size 2.75 x 4.75 x. Box Size 7 x 5 x 1.50. Operation up to 20 hours. Frequency range, Antenna #1: 50MHz 12Ghz.. Antenna # 2: 1.4-2.48 GHz and 4.9-5.875 GHz. If you are completely satisfied please take a moment to leave us feedback if you can. Delivering 5 star service is very important to us and we really appreciate our customers taking the time to leave feedback. Please verify your address during checkout. We are not responsible for any wrong or undeliverable addresses. If you have any questions or concerns, you can reach us during Monday-Sunday 24 hours. Return restrictions are detailed below. The item is subject to final inspection before your return is processed. 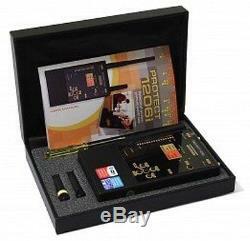 The item "Cell Mobile Phone GPS Spy Bug RF Signal Wire Tap SpyFinder Detector GSM CDMA" is in sale since Wednesday, July 22, 2015. This item is in the category "Consumer Electronics\Other Consumer Electronics". The seller is "blkptds" and is located in Nashville, Tennessee. This item can be shipped worldwide. Unit Size: 2.75 x 4.75 x .